Judge Dredd is a 1995 British-American science fiction action film, based on the comic book character of the same name, directed by Danny Cannon, produced by Edward R. Pressman, Charles Lippincott and Beau E. L. Marks, and written by William Wisher Jr. and Steven E. de Souza. The film stars Sylvester Stallone, Diane Lane, Rob Schneider, Armand Assante, and Max von Sydow. The film takes place in 2080 and depicts a dystopian world and the crime-ridden metropolis Mega-City 1. Following an unspecified disaster that turned Earth into a "cursed" wasteland, the survivors established a corps of Judges whose role combines that of police, judge, jury and executioner. The film follows Judge Joseph Dredd, one of the most dedicated Street Judges who had been framed for murder by his own half-brother—the psychotic Rico. The film was released on June 30, 1995. Reviewers criticized the film for its lack of its script, originality, and faith to its source material, along with Stallone's excessive acting. The film is considered to be one of Stallone's worst films, but received praise for its visual style, effects, stunts and action sequences, having been nominated for Saturn Awards. The film's reboot titled Dredd was released in 2012, starring Karl Urban in the title role. In Mega-City One, 2139, Joseph Dredd, one of the most dedicated "Street Judges", assists first-year Judge Hershey in ending a block war. Herman "Fergee" Ferguson, a hacker recently released from prison, is caught in the firefight and hides inside a food dispensing robot. Dredd arrests Herman for destruction of property, and sentences him to five years' imprisonment. Rico, a former Judge, escapes from prison with the help of Judge Griffin. He returns to Mega-City One and reclaims his uniform and "Lawgiver" gun. He also finds and reactivates a decommissioned ABC Warrior combat robot. A news reporter critical of Dredd is murdered, and he becomes the chief suspect. Dredd is taken to a trial before a tribunal of Council Judges including Griffin and Chief Justice Fargo, his mentor. Although Hershey, who Dredd chose as his defender, proves that the camera footage showing that Dredd killed the reporter is falsified, he is found guilty as his DNA is found on the bullets used to kill the victim (a feature of the Lawgiver is imprinting the user's DNA on each bullet, a fact apparently unknown by most Judges). To save Dredd, Fargo steps down as Chief Justice and, for his last request, asks the Council to spare Dredd's life. Dredd is sentenced to life imprisonment instead while Fargo embarks on the "long walk", in which a retiring Judge ventures into the wasteland "to bring law to the lawless". Griffin, who freed Rico to frame Dredd for the murder, becomes Chief Justice and instructs Rico to cause chaos in the city. Dredd is taken to the Aspen penal colony via airship, where he sits next to Herman. En route, the ship is shot down by the Angel Gang, a family of cannibalistic scavengers and bandits. They bring Dredd and Herman back to their cave. On orders from Rico and Griffin, a squad of soldiers investigate the crashed ship and the cave, intent on killing any survivors, thus essentially liquidating any incriminating evidence. Fargo arrives in time to save Dredd's life, but is mortally wounded by Mean Machine Angel. A dying Fargo reveals that Dredd and Rico are the result of the Janus project, an experiment in genetic engineering intended to create the perfect Judge using Fargo’s DNA. However, Dredd had the "good genes" and became a lawgiver while Rico became a criminal (since he had "bad genes"). Dredd deduces Rico framed him for the reporter's murder, using their identical DNA. Believing Griffin is trying to reactivate the Janus project, Fargo urges Dredd to stop him. In Mega-City One, Rico terrorizes the city and assassinates Judges in various ways. Griffin uses the situation to persuade the Council Judges to unlock the highly secure Janus files, so he can create an army of Judges from his DNA. After the Council Judges unlock the file, Griffin has them killed. Dredd and Herman sneak back into the city and meet with Hershey, who had also discovered the Janus project by herself. They go to the Statue of Liberty where the Janus laboratories are located. The ABC Warrior intercepts them, wounds Herman and captures Dredd and Hershey. Rico uses his own DNA as a template for the Janus clones, then commands the ABC Warrior to kill Griffin. Herman, despite his wounds, disables the ABC Warrior as Dredd fights Rico, while Hershey fights his assistant, Dr. Ilsa Hayden. Rico activates his clones prematurely, but they fail to stop Dredd, and the swift clone activation ends up destroying the Janus laboratory. Dredd pursues Rico to the top of the Statue of Liberty, and a final struggle sends Rico falling to his death. Ilsa tries to shoot Dredd, but Hershey kills her. Central, the city's controlling supercomputer, has recorded the entire event and broadcasts the information, clearing Dredd's name. The remaining Judges ask him to become the new Chief Justice, but he refuses, preferring to remain a street judge. James Earl Jones provides the narration to the film's opening text crawl. Adrienne Barbeau provides the voice of the Hall of Justice Central Computer. James Remar makes an uncredited appearance as the Block Warlord in the opening sequence. Prior to production, the producer Edward Pressman had the script rewritten by Walon Green, Rene Balcer, and Michael S. Chernuchin. Gianni Versace had submitted designs for Dredd's outfit, which were rejected. Although film composer David Arnold was originally set to score the film, having collaborated with director Danny Cannon on his previous film The Young Americans, Arnold was replaced by film composing veteran Jerry Goldsmith, but as post-production dates fell further and further behind, Goldsmith was forced to drop out of the project as well, due to prior commitments to score other films (First Knight and Congo). Prior to leaving the project, Goldsmith composed and recorded a short piece of music that would eventually be used for the film's trailers and advertising campaigns. In the end, Alan Silvestri was selected as the new composer and would go on to score the final film. He initially recorded the soundtrack with the Sinfonia of London. But following changes made to the film in post-production, Silvestri had to make extensive adjustments to his score by re-recording segues and cues in Hollywood, though some of the music from the London sessions remains in the finished film. The end credits song for the film, "Dredd Song", was written and performed by the English alternative rock band The Cure. The song appears on disc three of their 2004 rarities box set Join the Dots: B-Sides & Rarities 1978–2001 (The Fiction Years) as well as on the film's soundtrack album. The song "Judge Yr'self" by the Manic Street Preachers was originally going to be on the soundtrack. Their guitarist Richey Edwards disappeared in early 1995, and since the song was the last written with him in the band, it never made it to the final soundtrack listing. The song was not released until 2003, when the band released Lipstick Traces (A Secret History of Manic Street Preachers). In 1995 Epic Records released a soundtrack album featuring seven tracks from Silvestri's score (all performed by the Sinfonia of London but most were not versions used in the film) and songs by The Cure, The The, White Zombie, Cocteau Twins, Leftfield. The UK edition also had Ryo Aska and Worldbeaters with Youssou N'Dour (only the first two songs are heard in the film over the end credits). In 2015, Intrada Records issued a greatly-expanded two-disc, limited-edition album featuring all the music Silvestri recorded for the film. The album also includes the trailer music conducted by Jerry Goldsmith. This had only previously released as a re-recording – conducted by Joel McNeely – on the Varèse Sarabande compilation entitled Hollywood '95. 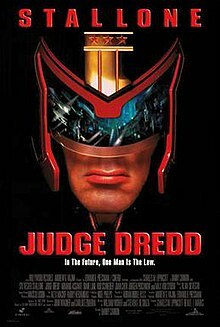 Prior to the film's world premiere on 30 June 1995, Judge Dredd had to be re-cut and submitted to the MPAA five times in order to get it down from a NC-17 to a R rating. This was before Stallone and the studio tried to cut the film even further to get a PG-13 rating. Director Danny Cannon was so disheartened over the constant creative disputes with Stallone that he swore he would never again work with another big-name actor. He also stated that the final version was completely different from the script due to the creative changes demanded by Stallone. In later interviews, Stallone said he thought the film was supposed to be an action comedy film so demanded rewrites to make it more comedic. However, the director and screenwriter had a darker, more satirical vision. Several entire sequences were deleted from the theatrical release to reduce the violence and darker tone of the film. For example, a scene where Rico kills news reporter Hammond and his wife was originally longer and bloodier because it showed them getting hit by bullets in slow-motion. Likewise the ABC Warrior robot was to kill Judge Griffin by ripping his arms and legs off but this was also changed. Cannon wanted more violence (because it was in keeping with the comic's source material) but the studio and Stallone wanted a PG-13 movie with more focus on humour. Even the film's climax was deleted, scenes showing Dredd fighting and killing clone Judges was removed prior to the theatrical release. However, some promotional stills do exist showing Dredd shoot one of the clones. The film was considered to be a flop in the United States, as it grossed only $34.7 million in North American domestic box office receipts. It did better internationally, with over $78.8 million around the world, reaching a total of $113.5 million worldwide. The film was largely panned by critics. Review aggregation website Rotten Tomatoes gave the film a score of 17% based on reviews from 52 critics, with an average rating of 3.7/10; the site's critical consensus is "Judge Dredd wants to be both a legitimate violent action flick and a parody of one but director Danny Cannon fails to find the necessary balance to make it work." Audiences polled by CinemaScore gave the film an average grade of "B" on an A+ to F scale. Gene Siskel voted Judge Dredd one of the worst motion pictures of 1995 as part of his 'Worst of 1995' review on Siskel and Ebert. Stallone received a Worst Actor nomination for his role as Judge Dredd at the 1995 Golden Raspberry Awards. Other opinions, however, were favorable. At the 22nd Saturn Awards the film received nominations in four categories (Best Science Fiction Film, Best Special Effects, Best Costume and Best Make-up). Richard Trenholm from CNET wrote that the film "drew more more shrewdly on the comic's abundant history than the 2012 version" and "absolutely nailed the look of Mega City One". Trenholm noted that "sets, costumes and vehicles were fantastic", while "looming ABC warrior and grotesque Angel Gang" were "both triumphs of pre-CGI physical effects". I loved that property when I read it, because it took a genre that I love, what you could term the 'action morality film' and made it a bit more sophisticated. It had political overtones. It showed how if we don't curb the way we run our judicial system, the police may end up running our lives. It dealt with archaic governments; it dealt with cloning and all kinds of things that could happen in the future. It was also bigger than any film I've done in its physical stature and the way it was designed. All the people were dwarfed by the system and the architecture; it shows how insignificant human beings could be in the future. There's a lot of action in the movie and some great acting, too. It just wasn't balls to the wall. But I do look back on Judge Dredd as a real missed opportunity. It seemed that lots of fans had a problem with Dredd removing his helmet, because he never does in the comic books. But for me it is more about wasting such great potential there was in that idea; just think of all the opportunities there were to do interesting stuff with the Cursed Earth scenes. It didn't live up to what it could have been. It probably should have been much more comic, really humorous, and fun. What I learned out of that experience was that we shouldn't have tried to make it Hamlet; it's more Hamlet and Eggs. From what I recall, the whole project was troubled from the beginning. The philosophy of the film was not set in stone – by that I mean "Is this going to be a serious drama or with comic overtones" like other science fiction films that were successful? So a lotta pieces just didn't fit smoothly. It was sort of like a feathered fish. Some of the design work on it was fantastic and the sets were incredibly real, even standing two feet away, but there was just no communication. I knew we were in for a long shoot when, for no explainable reason Danny Cannon, who's rather diminutive, jumped down from his director's chair and yelled to everyone within earshot, "FEAR me! Everyone should FEAR me!" then jumped back up to his chair as if nothing happened. The British crew was taking bets on his life expectancy. John Wagner, the creator of the comic character on which the film was based, said when interviewed by Empire in 2012: "the story had nothing to do with Judge Dredd, and Judge Dredd wasn't really Judge Dredd even though Stallone was perfect for the part." He did however praise the production value and budget of the film. In an interview with Total Film magazine, he said the film had "told the wrong story" because it "tried to do too much". A newspaper strip adaptation by John Wagner and Ron Smith was serialized in News of the World. ^ "Stallone Deals Dredded Justice on the Big Screen". GamePro. IDG (82): 26. July 1995. ^ "Judge Dredd (15)". British Board of Film Classification. June 26, 1995. Retrieved October 5, 2016. ^ a b c "Judge Dredd (1995)". Boxofficemojo.com. Amazon.com. 1995-08-08. Retrieved 2013-05-05. ^ "The Top 100 Worst Sci-Fi Action Movies of All Time". Flickchart. Retrieved 2017-03-31. ^ "Sylvester Stallone: All Films Considered". Metacritic. Retrieved 2017-03-31. ^ David Hughes (2012-10-31). "Comic Book Movies - Virgin Film". Books.google.com. Retrieved 2016-02-26. ^ Goellner, Caleb (August 10, 2012). "Parting Shot: Versace Rejected Judge Dredd Costumes Party Like It's 1995". Comics Alliance. Archived from the original on August 30, 2012. Retrieved October 1, 2012. ^ Roger Feigelson. "Intrada Announces Alan Silvestri's Judge Dredd". Intrada.net. Retrieved May 12, 2015. ^ "Judge Dredd (2CD)". Store.intrada.com. Retrieved 2016-02-26. ^ a b Mike Cecchini (2013-12-20). "Steven E. de Souza Talks Commando 2, Sgt. Rock, the Flash Gordon Movie You May Never See, and Much More! | Den of Geek". Denofgeek.us. Retrieved 2016-02-26. ^ "What was missing from the Judge Dredd film (1995)". Forums.2000adonline.com. Retrieved 2016-02-26. ^ "Judge Dredd". Rotten Tomatoes. Fandango. Retrieved 2013-05-05. ^ Wilson, John (2007). The Official Razzie Movie Guide: Enjoying the Best of Hollywoods Worst. Hachette UK. p. 50. ISBN 9780446510080. ^ "15 Things You Didn't Know About The Disastrous Judge Dredd". Screen Rant. 31 December 2017. Retrieved 14 February 2019. ^ a b "What Stallone's 'Judge Dredd' got right -- and 'Dredd' got wrong". CNET. 11 May 2017. Retrieved 14 February 2019. ^ "Stallone answers December 9th & 10th Questions in a double round - plus Harry's Seen Rocky Balboa". Aintitcool.com. Retrieved 2016-02-26. ^ "Latest Film Reviews | Movie News | Features | Interviews - Empire". Empireonline.com. gb. Retrieved 2016-02-26. ^ Talk Comix. "Interview With John Wagner at Glasgow Con 2012". YouTube. Retrieved 10 December 2015. ^ "Judge Dredd creator talks new film | GamesRadar". Totalfilm.com. 2012-01-20. Retrieved 2016-02-26. ^ "The 2000AD Links Project - collector zone". Web.archive.org. September 27, 2011. Archived from the original on September 27, 2011. Retrieved September 29, 2017. ^ "Judge Dredd (Judge Dredd) by Neal Barrett Jr". Fantasticfiction.co.uk. Retrieved 2016-02-26.